From old jars of jams and preserves to all those jars of cookie mix you get around the holidays, chances are your home has collected several empty mason jars. Freshen up your decor for spring with some DIY mason jar home accessories. Here are 12 mason jar DIYs to get you inspired to decorate your home. Relax on the weekends by sipping your cup of coffee and watching birds in your backyard with this easy DIY. Using a mason jar you can make a bird feeder perfect for your backyard that will attract local birds to your home. Showcase some of your favorite spring flowers by constructing a shelf with built-in flower vases. The completed shelf can then be mounted on a wall or window so you can display fresh blooms in your home. Enhance an ordinary mason jar with pastel paint for the perfect spring vase. Once completed, your vase is an excellent way to display fresh cut tulips or daffodils in your home. Spring is the perfect time to start gardening! Bring your gardening indoors by starting a terrarium. You can easily make a terrarium by adding plants, soil, and rocks into a large mason jar. This DIY project is perfect for the kids to help out with, as it is very simple to do. While doing your spring cleaning, replace your winter home accessories with fresh pastels for spring. 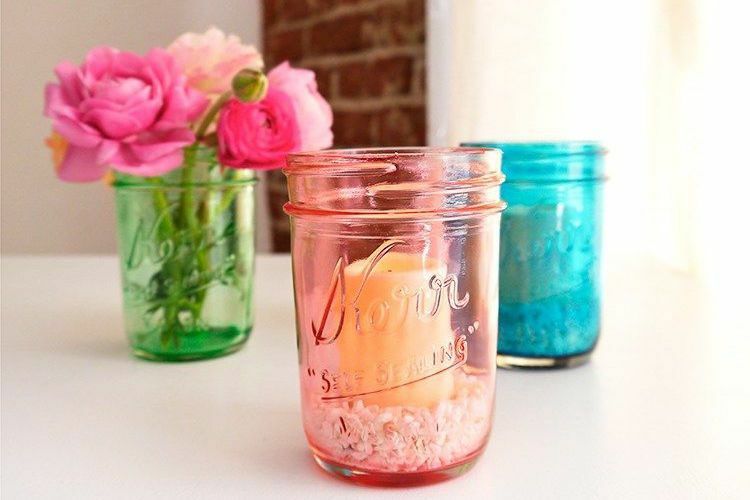 These pastel mason jar candle holders are the perfect spring accessory for your home! One great way to give your mason jars a new look is to paint them with ​a chalkboard finish. The rustic, vintage appeal is great for a backyard wedding, or they would simply add some charm to any outdoor event. Enjoy the warmer nights of spring and summer outside on your patio with these illuminating mason jar lights. One great way to display outdoor lights is with a string or rope. Hang them off your pergola or patio umbrella. Even if you do not have a yard to garden in, you can still start a small garden indoors. Don't have a lot of indoor space to spare? Go vertical. These wall mounted planters are perfect for growing flowers or herbs in your home. Keep the mosquitos away with DIY citronella candles. Best of all, these DIY mason jar citronella candles are refillable, so you reuse them every year. For an easy gift idea, cover a mason jar with glitter to make a fun spring vase. The completed vase is ideal for a variety of occasions, like birthdays, anniversaries or Mother's Day. Freshen up your home this spring by adding the clean and relaxing smell of lavender. These homemade mason jar candles are perfect for the bedroom, as the smell of lavender will help you fall asleep at night.